Perfect everyday conditioner with eternal shine. 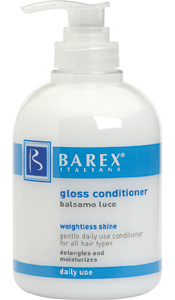 Barex Gloss Conditioner is a daily conditioner for all hair types. It enhances shine while detangling and eliminating static electricity. Surrounds the hair shaft leaving the hair moisturized and strengthened without adding weight.